Weekend Review, Donington Park GP. For Round 5 I elected to race with an alternative club. I chose Hottrax after hearing good things. We arrived on Friday evening and setup, as this was my first time out with this club I didn’t know anyone at the circuit. After an hour or so of running the generator it packed up leaving me in a bit of a situation. I set off around the paddock introducing myself to people and asking if they had a generator I could borrow, eventually I found a top bloke Lee Wilson. He lent me his spare generator for the weekend, top top bloke. Qualifying on Saturday morning was a tricky affair, I went out on dry tyres but very soon after starting qualifying the rain started to fall. I managed to qualify in 38th in front of 3 1000’s and a ZX7R with a time of 2:03.68. 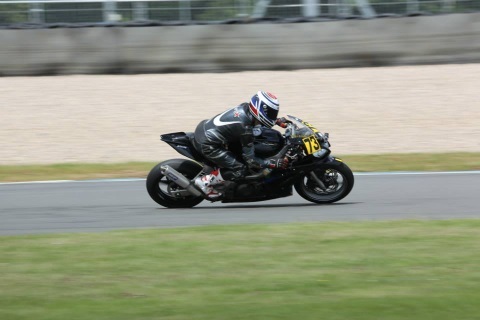 Race 1 came around quickly and I was a little confused when I started the race from 23rd which turned out to be last. I later realised that the 1000’s are in a different class so when they were removed from our grid it left 23 riders. The race was good fun, and I enjoyed battling with the 600’s, there is something satisfying about passing a 600 and keeping them behind you especially when you know your riding 72bhp! I finished the race in 13th with a fastest lap of 2:06.03 which was second in class. Race 2 was on the Sunday. I was a little surprised to be lining up in 23rd again, last on the grid but at Hottrax you start all races from your original qualifying position. Sunday morning was dry so the first race was a good battle. I finished in 16th, 1st in class with a new personal best lap of 1:51.67. Race 3 was after lunch and the rain was falling now. Again I lined up in 23rd and battled my way through to a finishing position of 9th, 2nd in class with a best time of 2:11.51. Race 4 was the 600’s and the 1000’s combined after the weather had stopped racing earlier in the day. The grid was split with the thou’s at the front. The rain had stopped now but the track was still wet, I toyed with the idea of running a wet front and a dry rear but in the end I opted for the wets. The race was 8 laps and by about half way there was a clear dry line and the wet part of the track was not that wet, maybe a gamble on the dry rear would have paid off! I went from last again to finish in 14th in front of three superbike’s two ZX7R’s and a GSXR750 as well as a couple of GSXR600’s, a ZX636, and a ZXR400. I completely destroyed my rear tyre and set a fastest time of 2:02.50 to finish first in my class.